Our hawaiian print seat covers are a special brand for our tropical lovers. They will add distinction and class to your vehicle. This is our premium line of Hawaiian covers that are made from a thick, durable material. You will feel the quality when you hold them in your hands. 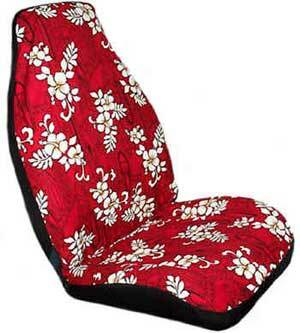 Slip a pair of hawaiian seat covers on your car and you will be saying aloha every time you climb in your vehicle. The material is made from a waterproof PVC and poly blend. Treat yourself right today and add a pair to your shopping cart now!